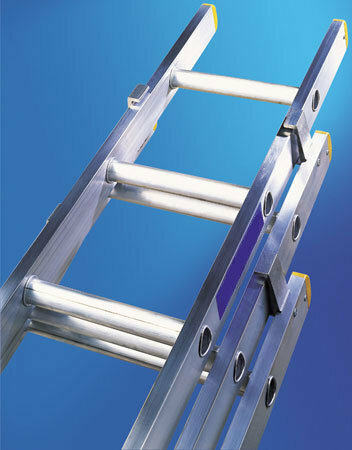 We carry a complete stock of Class 2 Commercial EN131 rated extension ladders from 12’ to 33’. 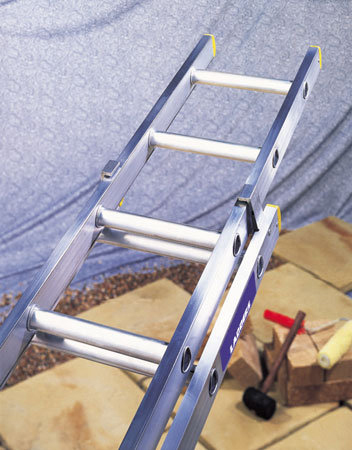 There are 11 different size extension ladders in the range.The range of extension ladders has box section styles and ‘D’ shaped rungs for rigidity and comfort.These aluminium extension ladders are available as either 2 sections or 3 sections and are suitable for both Trade and Domestic use. Suitable for both ‘Trade’ and ‘Domestic’ work. New D profile rungs adding more comfort. Deeply serrated rungs giving non slip grip. Extruded box section styles adding extra strength. 1 Year warranty is given with these quality ladders. Once you buy one of our ladders there are a number of other products you might want to look at – stoppers, stand-offs, stabilizers of all sorts. These items prevent ladder slip and twist and make the product safer in use.